We can finally share some beautiful images from a 1920s vintage styled shoot by the super talented photographer Jessy Papasavva which featured a bespoke Titania draped headpiece we made for the flowergirl, AR546 and the Dina draped vine, AR579 worn by the bride to match her Sharon Bowen Dryden wedding dress. 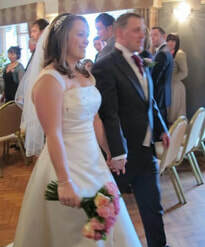 The shoot will be featured in You & Your Wedding and you can read the full blog by Jessy here. We were delighted to be working with Switch Magazine, an Italian publication before Christmas on an editorial photoshoot at Villa Stagni, an ancient villa near Bologna, Italy. Our beautiful Andromeda hair vine (AR571) was worn to match Stefania Lo Muzio's 'Serresse Couture' wedding dress from her latest 2019 'The Secret Garden' collection. ​We're so excited that our new crystal colour White Opal is taking off. It has a white milky tone that catches any colour on the spectrum and is a perfect alternative to the traditional clear crystal. We introduced the crystal colour to our colour chart last year and the response from our stockists as well as brides has been amazing! 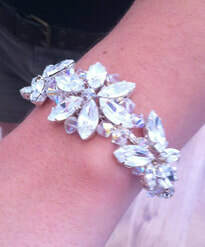 We made the beautiful Kalani hair vine using the white opal crystals. Meaning "the heavens" in Hawaiian the Kalani half halo has a Polynesian feel with its large leaves and floral accents. A multi use style, this piece looks great worn both at the back of the hair or across the front of the head as either a browband or headband depending on your bridal style. Designer's Tip: "Pin at the top of a full length veil in the back of the hair for a beautiful wedding look"
Literally, how is it February 2019 already?? It's ridiculous how fast this this year is going so far which is good, but we have so much planning to do for the year ahead and would just like time to slow down a little. We've been really busy designing and making pieces for our new 2020 collection and we will be giving our stockists a little sneak preview at the White Gallery London buying event in March which we're very excited about ... We're sharing the stand with our beautiful boho bridal brand Charlotte Balbier Bridal, eek! We are also feeling very excited at HQ because we have now welcomed 2 more stockists to our family; The Silk Loft in Y Felinheli in North Wales and Eva Ashley Bridal Lounge who have a boutique in Tonypandy and Swansea. ​Located in the beautiful village of Y Felinheli, The Silk Loft is a bright, welcoming space that recognises the special experience that every bride deserves. The lovely Katie is on hand to offer her knowledge and guidance to help brides find a dress and finishing touches that enhances their individuality and style. Eva Ashley was founded in 2014. The concept was to create a bridal salon that would lead the way in creating a unique bridal experience. A friendly, welcoming environment as far removed as possible from the stereotypical, pretentious bridal salon image of days gone by. Tiaras are a classic wedding hair accessory and the most popular. All of our tiaras are made by our clever little design team based in Lincolnshire and sold through our carefully selected boutiques across the globe. 1. AR565 Celeste Headband - Delicate side tiara made up of of pearl & crystal branches with diamante leaves for a hint of sparkle. 2. AR567 Cressida Tiara - Beautiful pearl and crystal bridal tiara in a traditional shape. 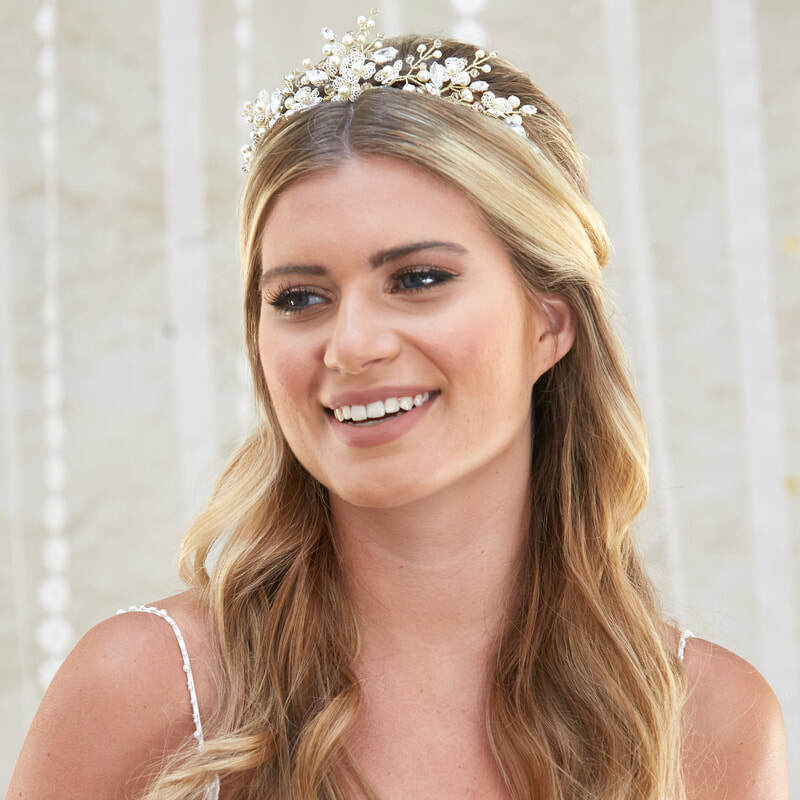 3.AR569 Evangeline Tiara - We love this pretty handmade pearl wedding tiara with its unusual laurel style shape which doesn't peak in the centre. 4. AR177 - Traditionally shaped bridal tiara with marquisse set diamantes and crystals on hand wired stems for maximum sparkle. 5. AR261 - Versatile low band style tiara with a scattered pearl & crystal design. 6. AR405 - ​Traditionally shaped wedding tiara with marquisse set diamantes, pearls and crystals on hand wired stems. Each month our designer picks one of her favourite pieces to feature on the website. This month it's our vintage style Seren Back Jewellery, ARN112 featuring a pearl & crystal strand with chain drapes suspending a diamante 5.5cm dropper. Easily attaches to the dress with jewellery clasps which clip onto loops sew on the dress straps. "Add a touch of vintage sparkle to a low back dress to create extra interest to your wedding dress or party dress for the coming season!" We offer a conversion service for our tiaras where, for a small fee, you can return your headpiece to us and we will turn it into a piece of jewellery of your choosing to wear again and again for special occasions! This week we're absolutely loving the pearl and crystal Cressida Tiara, AR567. Beautifully handmade using pretty enameled filigree flowers in Ivory and marquise cut diamantes for a hint of sparkle. Our lovely model Grace wears this in her half up half down hair style in Soft Gold with Cream Pearls and Light Silk Crystals, perfect for a country church wedding. 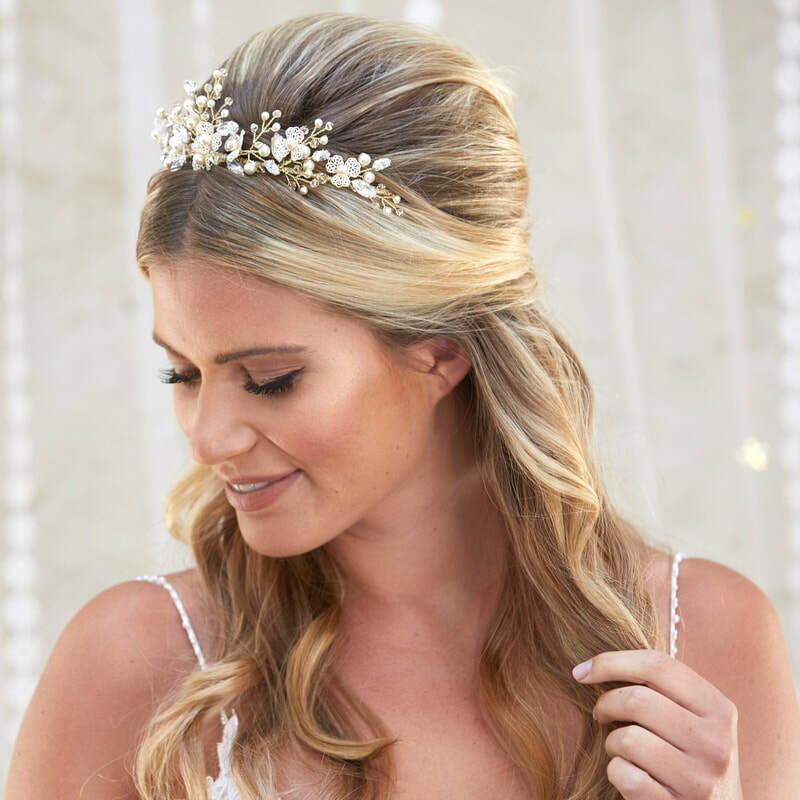 The thing we love about tiaras is that they look amazing worn on their own or paired up with a traditional veil, Cressida can also be hand-wired onto a hair comb as an alternative. Party season is just around the corner and we've got you covered with our beautiful handmade back necklaces, perfect for adding sparkle to any backless party dress. 1. ARN110 Trinity Back Necklace, an elegant triple row pearl & crystal back drape. 2. ARN111 Astrid Back Necklace, a simple pearl and crystal back necklace with diamante detail and 8.5cm dropper. 3. ARN112 Seren Back Necklace, a vintage style back necklace featuring a pearl & crystal strand with chain drapes suspending a diamante 5.5cm dropper. 4. ARN114 Apolline Back Necklace, a vintage style double strand back necklace with waterdrop diamantes in the centre of the strands and diamante details at the clasps. Each piece easily clips onto loops stitched on the straps / sleeves of your dress and comes in traditional bridal coloured pearl and crystals as standard but can be customised with our coloured crystals to match any party dress.